With the CBD Concentrate Marie Jeanne, make the most of, gracious to the Electronic Cigarette all wellness of the CBD molecule. For each flavour, Marie Jeanne proposes a CBD Concentrate which you can benefit with the molecule effects gracious to the high quality extraction. THe CBD Concentrate is a product which is made in France from cultivated Hemp entirely biologically agricultural in Europe. Each CBD Concentrate Marie jeanne is in accordance with the regulations in force and assures an e liquid without any traces of THC. You can find the aromas such as Lemon Kush, Super Skunk, even the Amnesia and other unique and savoury recipes. 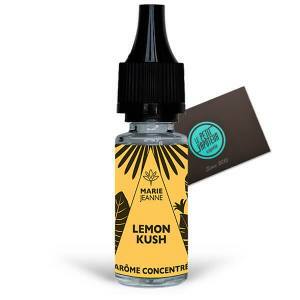 The CBD Concentrate Marie Jeanne offers you Hemp acidic aromas. This Marie Jeanne Concentrate proposes excellent Hemp aromas with beautiful sweet flavours. The CBD Marie Jeanne comes straight from the creation of the brand which specializes in bioloical agriculture. After being interested in wellness of the molecule, the French team wants to produce a product which can be very much appreciated. The inhalation means the body allows to absorb the Marie Jeanne turning naturally to vape.. This allows you to find different collections of concentrated aromas with a base of CBD and unique flavours such as: Marie Jeanne Lemon Kush and the beautiful citrus flavours, the Super Skunk with a sweet taste or even the Amnesia with the magnificent acidic aromas. Each CBD Concentrate Marie Jeanne is available in a 10ml bottle and can be mixed in a PG/VG base of 80/20.